Revising previous arthroplasties done in either the metacarpophalangeal joint or the ­proximal interphalangeal joint can be technically very difficult. Frequently, the bone stock has been either resorbed or eroded, making potential reimplantation of new joint replacements quite challenging. Furthermore, the soft-tissue envelope is usually severely scarred, and there can be issues with tendon imbalance as well as ligamentous laxity. This combination of bone and soft-tissue factors sometimes precludes the ability to perform revision implant surgery. In these circumstances, arthrodesis can be of benefit; however, care needs to be taken to try and not unduly shorten the digit, which could lead to tendon imbalance. Ultimately, in some cases where there is such significant structural loss of the finger or where the finger has no functional usage, amputation can be considered. 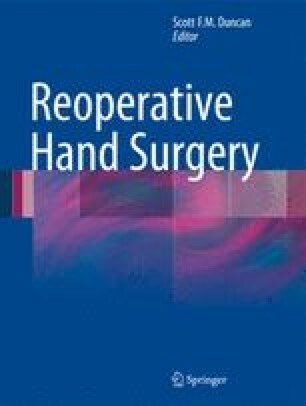 Ultimately, the patient needs to understand that the revision surgery is unlikely to yield improved motion but is done in order to try and help preserve hand function while reducing any pain or other symptoms that the patient may be having.